Girl power: in 1876, Clara McCarty was the very first graduate of the University of Washington in Seattle. Just one of the many nuggets of information packed in these two books by Judy Bentley: Hiking Washington’s History and Walking Washington’s History: Ten Cities. Hiking Washington’s History weaves historical highlights and slices of what life was like for both the Native Americans and the early European settlers. The book covers trails in every region of the state with practical details on directions to the trailhead, degree of difficulty, maps, and historical highlights. Walking Washington’s History: Ten Cities is for the urban explorer and focuses on Yakima, Walla Walla, Spokane, Vancouver, Bellevue, Seattle, Olympia, Tacoma, Everett and Bellingham. Enjoy tales of the introduction of apples to the state by Hudson’s Bay Company factor, John McLoughlin (the oldest apple tree in the state is in Vancouver and first bore fruit in 1830), the stainless steel sculpture of “Wendy the Welder” honoring women who worked in the shipyards during World War II, and the tallest totem pole in the nation found in Tacoma and dating back to 1903. Each chapter has a brief historical summary followed by walking tours within the city ranging in length between 2 and 7 miles. Again practical information is included such as amenities, transportation, directions and parking. 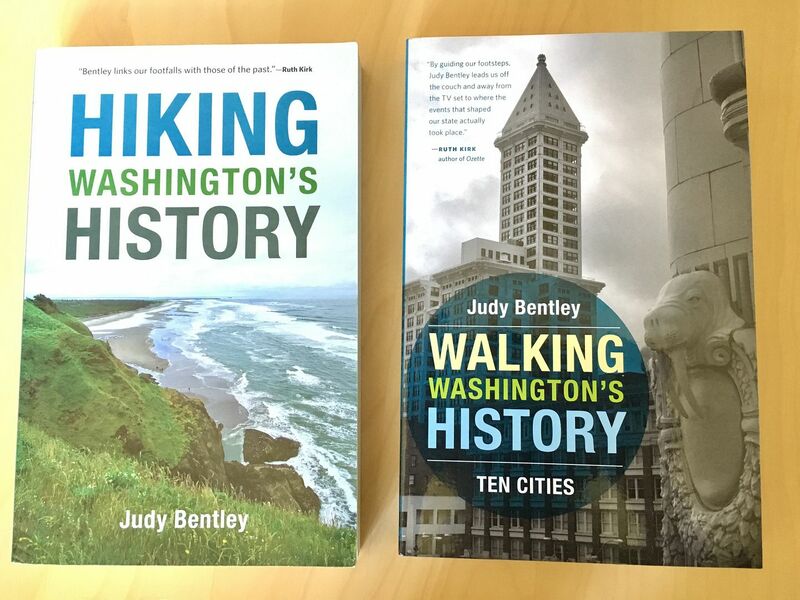 Enhance your exploration of the Evergreen State with Judy Bentley’s books, Hiking Washington’s History and Walking Washington’s History: Ten Cities.